Throughout history, societies have produced literary works like The Iliad or The Aenied that define a nation’s character and its people. In 1928, Stephen Vincent Benet published John Brown’s Body, 15,000 lines of blank verse exulting the spirit of the American people as seen through the prism of its defining historical moment, the Civil War. Like Homer and Virgil before him, Benet used poetry to give moral significance to a time of seminal change and profound tragedy. An accomplished writer since his collegiate days at Yale, Benet won a Guggenheim Fellowship in 1926, the first ever awarded for poetry. 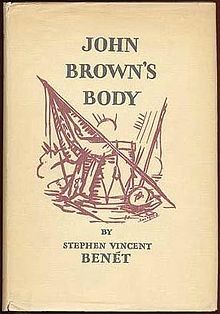 He composed John Brown’s Body, his best known work, over two years while living in Paris because his funds would last longer there and, he said, “living abroad intensified my Americanism.“ Benet was an unabashed liberal. He understood the Civil War as the pivotal event in the evolution of the United States into a democratic, progressive, and pluralistic society. He made sense of the war’s horrific loss of life much as Abraham Lincoln did; as a necessary, divinely ordained, shedding of blood before the nation could be redeemed from the sin of slavery. The 1920’s were a critical period in the creation of Civil War memory and many Americans did not share Benet‘s progressive views. For aging white veterans, blue and gray, it was their last hurrah; a chance to cement their vision of battlefield sacrifice into the public’s mind and give meaning to the deaths of thousands of their comrades. Reconciliation between old foes and honor to all old soldiers was the order of the day. For African Americans, the war’s living legacy, it was a much different time. They found themselves emancipated but far from free. For them, the roaring 20’s was an era of virulent racism, social segregation, political disenfranchisement, and sudden violence. Jim Crow Laws, Black Codes, a resurgent Ku Klux Klan, and the public lynching of blacks all across America seemed to mock Lincoln’s vision of a more perfect Union. Benet chose to mix historical personages with fictional characters from all walks of society to create his vision of a balanced, optimistic, and reconciliationist national saga about the war and the effect it had on the people who lived through it. Like Walt Whitman, his model, Benet, too, heard America singing and attempted to capture its disparate melodies in verse. Although John Brown himself is hung barely a third of the way through the book, he is the poem’s guiding spirit, hovering over the entire work like an apocalyptic flame right out of the Old Testament who loosed a flood of fateful events that would change every aspect of American life. unjust enactments, I say, let it be done. Brown’s powerful words were soon memorized and whispered in countless slave quarters throughout the South. They were reproduced in newspapers throughout the North and evangelical clergymen read them from hundreds of pulpits. To millions of enslaved black people and many whites, John Brown’s body, hung on a gallows at Charlestown, VA on Oct. 16, 1859, symbolically had become the crucified Christ. But to southern slave owners, his spectral figure was repeatedly likened to the Arch Fiend himself. Benet, himself, had a love-hate relationship with Brown. “You did not fight for the Union nor wish it well,” he wrote. “You fought for the single dream of a man unchained.” For an avowed progressive nationalist like Benet, the war could not be justified merely because it freed the slaves. A new, more perfect, nation had to arise from the carnage of the conflict; a political consequence that Brown never envisioned. The other Christ figure in the saga is, of course, Lincoln. After the fiasco at First Manassas in July 1861, Benet describes him as “awkwardly enduring…neither overwhelmed nor touched to folly.” Lincoln must now begin the laborious job of “kneading the stuff of the Union together again.” His work is likened to a divine mission. “And yet Lincoln had a star, if you would have it so,” Benet writes, obviously alluding to the polar star that led the Three Wise Men to Jesus‘ manger, “and he was haunted by a prairie-star,” possibly referring to Lincoln’s Midwest heritage or to John Brown’s Kansas abolitionist activities. Benet is also adept at taking historical situations and vividly rendering them into emotional literary images. He portrays Edmund Ruffin, the rabid abolitionist who fired the first cannon at Fort Sumter, walking in his Richmond garden with a Confederate flag around his shoulders, shoot himself in the heart upon learning of Lee’s surrender. Benet describes General Grant when he sees Confederate bonfires celebrating the birth of George Pickett’s son. He orders his soldiers to do the same and sends a silver service for the baby. Just days later, Grant attacks Pickett and the Confederate army at Petersburg. Other critics consider his fictional characters, representing Northern and Southern archetypes, to be more fully developed. Jack Ellyat, the hardy New England abolitionist is balanced against Clay Wingate, the haunted plantation owner. Jake Diefer, the Pennsylvania yeoman and Luke Breckinridge, the illiterate backwoods hunter; Sally Dupre, the Southern belle and Melora Vilas, a subsistence farmer’s daughter; Cudjo, the loyal house servant and Spade, the slave who escapes to freedom all characterize traits of the common people Benet so admires, people who suffered, fought, and died to bring about a new birth of American freedom. Benet treats them all with honor and respects the choices they made. John Brown’s Body does on a grand scale what Stephen Crane’s novel, Red Badge of Courage, does on an individual level. Both writers use fictional characters to put immediacy, feeling, and emotion into history. They adhere to Aristotle’s maxim that poetry can reveal universal truths while history is confined to particular truths. By following this methodology, both writers give immediacy and a personal focus to the events they recreate. That’s not to say a poet can’t be a good historian, too. Benet remembered stories told to him by his father and grandfather, both graduates of West Point and career military officers. He devoured the Official Record, Battles and Leaders of the Civil War, and read countless collections of letters, diaries, and memoirs. His set-piece descriptions of battles like the First Manassas, Shiloh, Fredericksburg, and Gettysburg are lyrically rendered and historically accurate. Very popular when it was published, John Brown’s Body is rarely read today. Nevertheless, it remains a vibrant tapestry of America’s diversity and its unity by reimagining the war as Lincoln understood it -- a new birth of freedom, a nation redeemed, and a people re-unified.